I added a few new tricks to my repertoire last year. One of the most effective, and definitely the most fun, was trail running. And I’m not talking about that asphalt path with the water fountains along the side. I’m referring to the mud-up-to-your-ankles, tripped-over-a-root-and-got-this-sweet-bruise, lost-in-the-woods-for-hours kind of trail running. Fun stuff. At least once every other week, I’d head out to one of three multipurpose trails. I’m pretty lucky to have a few mountain bike trails and a bridle trail fairly close to my house. 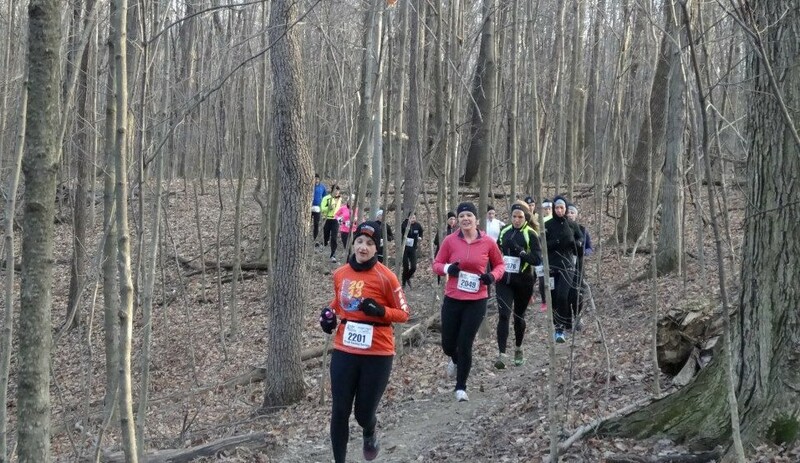 The first race in a 2-part series put on by Rock and Roots Trail Runners, a group established by Fleet Feet Columbus, took place yesterday despite the cold temps. At least the race wrapped before the freezing cold wind moved in! 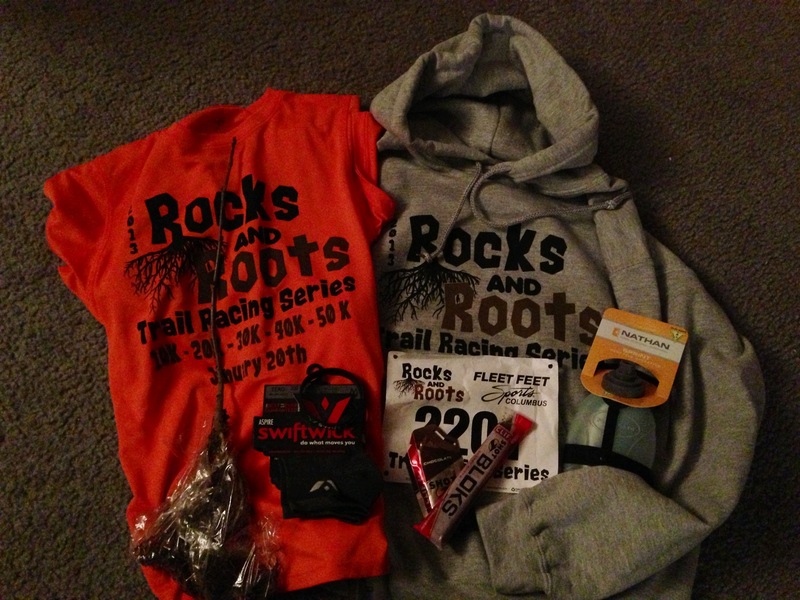 A hooded sweatshirt, Swiftwick socks, Nathan handheld bottle, and some Clif fuel products. This was in addition to the event shirt for each race. I’ll admit, I thought the sweatshirt was a little lame, that was until I finished the 10K I registered for, and was waiting on a friend to finish her 20K. Did I mention it was freezing cold? It was at that moment I remembered the sweatshirt was in my car. Perfect! The unique part about this race series is the ability to choose from several distances, in this case 10k up to 50k, and the course had an 8hr open time, allowing a 15:27 pace for the 50k. Even more tempting was the “Double 50” belt buckle for doing both 50Ks, set a month apart. Completing the Goofy just a week prior, and some wise words from a few caring friends, brought me back to reality. If I want to run the rest of this year, I need to take some recovery time. 10K on trails would be enough. Besides, I have nothing to prove. The race took place at the Alum Creek Phase I Mountain Bike trail, commonly called P1. It’s the easiest of the 3 available trails, but still includes a few challenges. The switchbacks are not as steep as P2 or the bridle trail, and the bridges are much wider. There is also a longer “boardwalk” section, and usually a river crossing, although a brand new bridge over the stream took that danger away (my least favorite part of P1 is getting my feet wet). 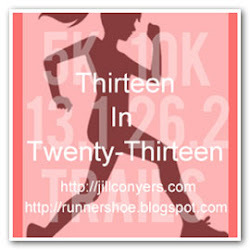 A great course for beginners that allows for faster running for those more experienced. Temps were in the low 20s, and the wind brought it into the teens. The ground was pretty frozen on the first 10K lap, and I was thankful that was all I was doing. I’m sure the course got pretty sloppy for the 50K-ers. Single track means it’s tough to pass. The best thing to do is call out “on your left” or “passing”, and find a safe place to go around. Try to avoid that section were the cliff drops off on the right…you can spook a newbie trail runner pretty easily, and the last thing you want to do is send them tumbling down the hill. No elbows, and no pushing. This isn’t a track meet. A trail race environment is nothing like a road race. Pace is irrelevant. People wear GPS watches to capture elevation data…not their fastest mile on record. Relax. The race is more about a finish than a finish time. Look around. Enjoy the scenery. Candy, cookies, soda and potato chips are not junk food. We call that fuel. Eat up! A trail run is like a road run and a core workout together. Expect to be tired, body and mind. Constant scanning for obstacles can be exhausting, and your stride will be altered. You will fall eventually. And it’s nothing to be embarrassed about. Walking up a big hill is smart, not a sign of weakness. The longer the run, the more you will walk. I thought the race was great! I hadn’t been to this trail in month or so because I was nervous about falling so close to Goofy and injuring myself. Now that that’s out of the way, I’ll be back out there more. I didn’t fall either…which means my days are numbered! I did hear a few complaints that the trail was too crowded…mostly by people that aren’t familiar with this type of event. They will either learn and get over it, or not come back. Trail running isn’t for everyone. This entry was posted in Race Recap and tagged Alum Creek, outdoors, P1, race, Running, Trail, trail running, ultra, ultra running. Bookmark the permalink. Love your lessons learned! Absolutely correct, too 🙂 Good to see you out there, now lets get training for the next one! I hope it’s warmer in February. Otherwise that’s going to be a very miserable ultra. At least I’ll have a nice warm car to sit in after my 30k to wait for you to finish 🙂 (or I can go home, shower and come back….) 🙂 I’ll definitely be there for your finish, though! Love your primer on trail races! Most of my running has been on the road but this would be so fun to try! Trail running is a blast Leana. You HAVE to try it! I agree. completely different vibe at trail runs versus road runs. they each have their own good points. glad to see you getting out onto the trails (that’s my preference, too)! Nice job with race! I am glad they have these for people who like them – so not for me! I thought the non-tech sweatshirt was lame too and I am glad it helped you out!